The Global Volcanism Program has no activity reports for Garua Harbour. The Global Volcanism Program has no Weekly Reports available for Garua Harbour. The Global Volcanism Program has no Bulletin Reports available for Garua Harbour. The Garua (Talasea) Harbour volcanic field consists of a group of lava domes and ash cones of possible Holocene age. These volcanic vents ring the harbor on the west and form Garua Island to the east. Much of the volcanic field, including the two lava domes on Garua Island, consists of rhyolitic rocks. Active hot springs ring the shores of Garua Harbour and are best developed on the north and south sides. Large boiling pools, fumaroles, and small geysers are found on the north shore near Pangalu village. Another large group of boiling pools, fumaroles, and mudpots is located near the Talasea Government Station on the south shore of the bay. The Global Volcanism Program is not aware of any Holocene eruptions from Garua Harbour. If this volcano has had large eruptions (VEI >= 4) prior to 10,000 years ago, information might be found on the Garua Harbour page in the LaMEVE (Large Magnitude Explosive Volcanic Eruptions) database, a part of the Volcano Global Risk Identification and Analysis Project (VOGRIPA). There is no Deformation History data available for Garua Harbour. There is no Emissions History data available for Garua Harbour. The Garua (Talasea) Harbour volcanic field (upper right center) consists of a group of mostly rhyolitic lava domes and ash cones that ring the harbor on the west and form Garua Island (right center) to the east. Active hot springs ring the shores of Garua Harbour, including a large group of boiling pools, fumaroles, and mudpots located near the Talasea Government Station on the south shore of the bay, directly opposite the western tip of Garua Island. 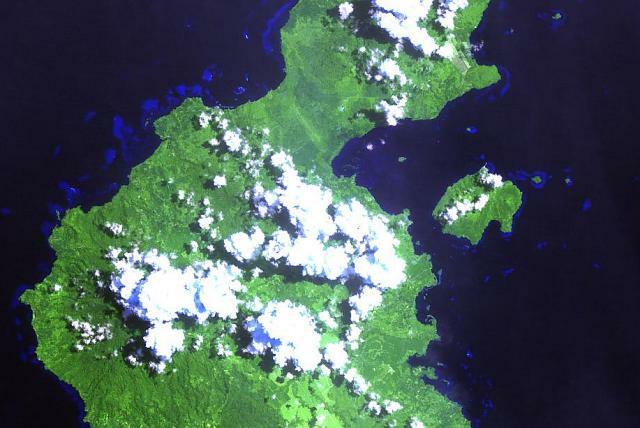 NASA Landsat image, 2000 (courtesy of Hawaii Synergy Project, Univ. of Hawaii Institute of Geophysics & Planetology). There are no samples for Garua Harbour in the Smithsonian's NMNH Department of Mineral Sciences Rock and Ore collection. Large Eruptions of Garua Harbour Information about large Quaternary eruptions (VEI >= 4) is cataloged in the Large Magnitude Explosive Volcanic Eruptions (LaMEVE) database of the Volcano Global Risk Identification and Analysis Project (VOGRIPA).